comfort and ways to honor and remember. Naming the Childcreates a community of love and support for bereaving parents and siblings, written with a light touch and sensitive spirit. "When I was nineteen weeks pregnant with my second child, Emma, I had a miscarriage. Its impossible to know ahead of time how such an experience will impact you or your marriage. I recognized many of the challenges I faced inNaming the Child. I can say with confidence that this is an amazing resource." 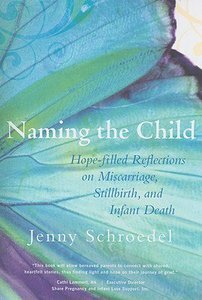 Jenny Schroedel (Chicago, IL) is a columnist for Boundless Webzine and has published numerous articles about spirituality and practical life. She is the author of a children's book. The Blackbird's Nest: Saint Kevin of Ireland.